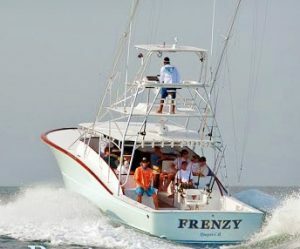 This 43ft Custom Sport Fisherman powered by twin Caterpillar C-9 diesels, and built by Maverick Sportfishing Yachts of Costa Rica in 2010, fishes out of Pez Vela Marina in Quepos. Captain José Hernandez is at the helm. Cruising at 28 knots, with a maximum speed of 32 knots, its angling platform features a Release Marine fighting chair, Rupp outriggers, and next-generation Furuno electronics, including 72-mile radar to find birds working bait. Along with a full range of state-of-the-art tournament-class equipment, the fully a/c cabin has a huge array of tackle drawers and an enclosed head with shower.